In August we had published Women physically abused in Waghavade village – Cops turn a blind eye, but even after a couple of months the Rowdy menace continues. Waghavade village is about 12 kms from Belagavi city and the horrifying story narrated by the women folk is heart shattering. 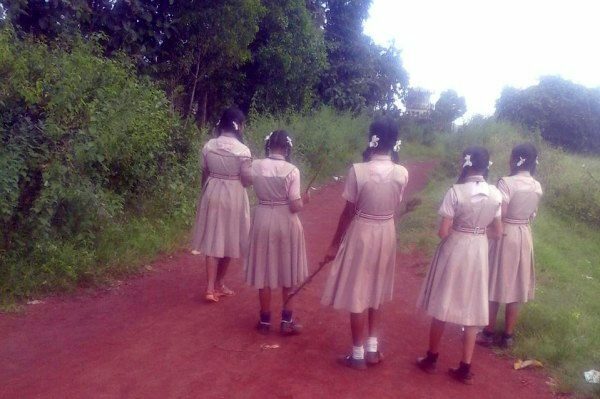 Now the School going girls have been walking with sticks in their hands for the past weeks so that they could defend themselves from the rowdies. Villagers of Waghavade have stopped sending their women out doors after dark hours due to the fear of few miscreants which are engaged in molesting activities. Several cases have been reported in the village wherein miscreants on two-wheelers physically abuse women walking on roadside. In August after the story was published in the Indian Express, the police had visited the village and acquainted themselves about the issue. Infact the local inspector visited the school and spoke to the girls about their grievances. The police later said the spoke to the residents of Markandey nagar who had assured them of nabbing the miscreants. But it seems all is in vain. Two floodlights were installed but this has not solved the problem. The worst part is the miscreants and eve teasers are least bothered about the police and we fear if this continues what kind of law and order is maintained. The Commissioner of police has said he will look into the matter. Hope this time the miscreants are nabbed and these women get their own space to move freely without any fear of anyone. If the police this time as well is not able to curb this menace it would bring shame not only to the department but on the society as a whole. If the women in out country are not safe and the police does nothing to stop how will this nation grow. If the women are not safe in her own village then where else can she be safe? However the biggest question is Will the Police Act this time atleast or are we waiting for something big to occur.